I bet most Outlook tasks are created as a result of email conversations. However, although there are tricks or macro scripts that can make tasks from emails, Outlook doesn’t offer a straight forward, “single click” method to create a task from email messages. You can flag an email so it gets listed as a To-Do item in your Outlook Tasks -> To-Do List window, but you can’t make a regular task item, with start and due dates, that can be assigned to someone else in your organization. 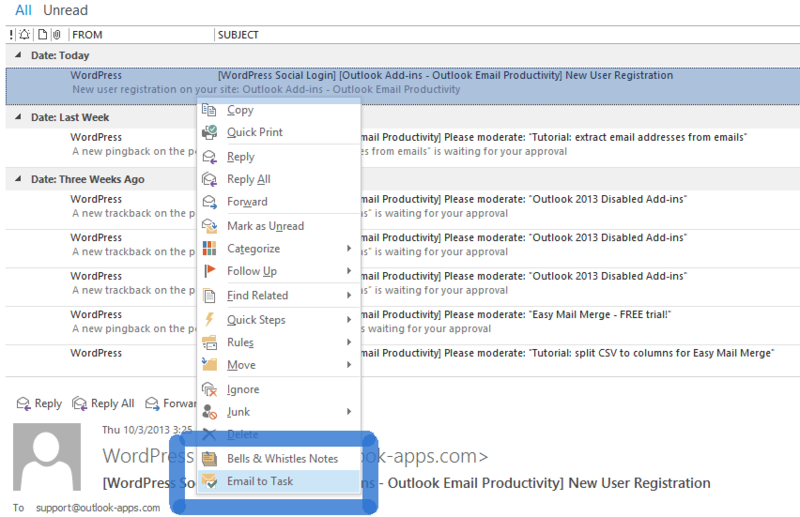 This article shows how to easily create tasks from emails in Outlook, using the Bells & Whistles productivity add-in for Outlook. To get started, you firstly have to download & install the Bells & Whistles add-in. The add-in is smoothly integrated in Outlook and it is compatible with all Outlook versions for Windows, including Outlook 2013 (x32 and x64). To create a new task from an email, simply right click over the desired email message and choose “Email to Task”. It is *that* simple! 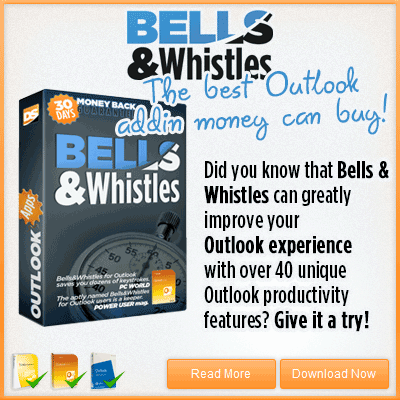 On top of the “Email to Task” function, Bells & Whistles includes several other productivity features that are designed to better your life with Outlook. Click here for a complete list of features.